A need thus exists to develop sustainable prevention-oriented approach, especially in countries with developing health care systems. Although some studies have explored knowledge and attitudes concerning prevention among medical faculties and dentists, orientation regarding preventive aspects is a rarely investigated field among dental faculties. In a study of dental educators' own oral health behavior, it was shown that there is room for improvement in this area. , Thus, the aim of the present study was to assess knowledge and attitudes toward preventive dental care among dental faculty and their relation to demographic and professional characteristics in Bangalore city. This was a cross-sectional study done over a period of 3 months from June to August 2013. List of dental faculty was obtained from the website of Rajiv Gandhi University Of Health Sciences, which served as a sampling frame. To obtain a representative sample of dental faculty working in a total of 17 dental colleges in Bangalore city, a simple random sampling approach was used. Four dental colleges were selected randomly for the purpose of the study. Faculty of Master of Dental Surgery (MDS) in the Department of Prosthodontics, Periodontics, Conservative Dentistry and Endodontics, Orthodontics, Pedodontics, Oral Medicine and Radiology, Oral Surgery, and Oral Pathology were included in the study whereas Faculty of MDS in the Department of Public Health Dentistry was excluded. The sample size was calculated based on total of 850 dental faculties in 17 dental colleges in Bangalore city. With the prevalence of knowledge (79%) from the pilot study, using confidence level of 95% and design effect 1, sample size was estimated to be of 197 participants. Considering 10% nonresponse rates 218 was taken as final sample size. Permission was obtained from the concerned authorities and the principal of the respective colleges. Ethical clearance was also obtained from the institutional review board. The dental faculties on the day of data collection were individually asked to voluntarily complete a pretested anonymous questionnaire. Majority of the filled questionnaires were collected back immediately on the day of data collection. Those faculties who said they were busy on the day of data collection and for a few days, a 1-week time was given, and questionnaires were then collected accordingly. Questionnaire used in this study was developed from the previous literature ,,,,,,, designed in English, which was validated, and modifications were then made accordingly before the final questionnaire was administered. A pilot study was conducted on 30 subjects who were selected randomly, to pretest the data collection methods and for the clarity and meaning of the questions. The pilot study subjects were not included in the main study. To estimate the reliability of the questionnaire used in this study, a questionnaire was given twice to the respondents, first on the day of the pilot study and then again after 1-week to ensure reliable answers. The co-efficient of reliability were calculated using Cronbach's alpha (0.81) that indicated good reliability. Questionnaire had five parts: Part one consisted of informed consent and demographic information of the dental faculty such as age, gender, Department of Teaching, and years of experience in teaching. Name was not recorded to maintain the confidentiality. Part two consisted information on dental faculty's participation in continuing education courses on prevention of oral diseases and their professional reading habits. Part three recorded information regarding dental faculty's familiarity with the field of Dental Public Health (DPH). The faculties were asked to express how well they were acquainted with the DPH field and how much work experience in teaching research and planning they had in the field. Part four assessed the knowledge of dental faculty regarding preventive dental care. Twenty statements regarding prevention of dental caries, periodontal diseases, oral cancer, malocclusion, and dental visit assessed the respondent's knowledge of prevention. Responses were recorded on a 5-point Likert scale, ranging from 0 to 4, that is, from "strongly disagree" to "strongly agree". Part five assessed attitudes of dental faculty toward preventive dentistry. Using the semantic differential method, a set of 6 pairs of bipolar adjectives, which describe preventive dentistry, was designed. The respondents were asked to describe their attitudes by choosing one option from a Likert scale, ranging 1-7; the higher the score, the more positive the attitude. Descriptive statistics included means and standard deviation of the respondent's knowledge and attitude scores. Statistical significances of the differences between the subgroups to be compared were evaluated using the Chi-square test for frequencies and ANOVA for mean values. The participants presented with a mean age of 35.3 years. Of 218 participants, 52.3% were males and 47.7% females. About 16.5% participants were from the Department of Periodontics; 13.3% from conservative dentistry and endodontics; 13.3% from orthodontics; 12.3% from prosthodontics; 12.0% from pedodontics; 12.0% from oral medicine and radiology; 10.5% from oral surgery; and 10.1% from oral pathology. 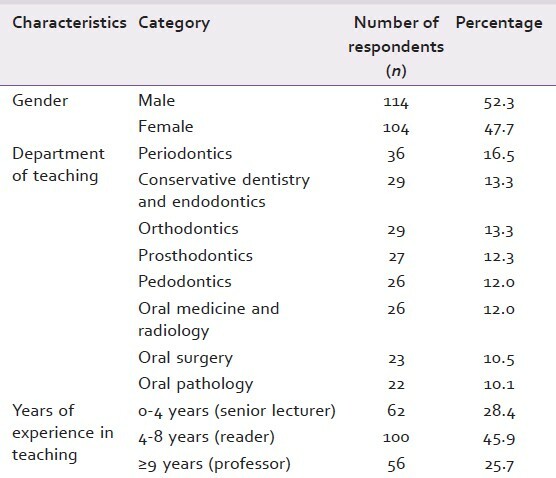 Majority of dental faculties were designated readers, based on their years of experience in teaching [Table 1]. Majority of the respondents had participated in continuing education courses within last year (72.5%) whereas only 21.1% participated 2-5 years ago and 5.5% had participated >5 years ago. Majority of the dental faculties read both specialty and nonspecialty journals. 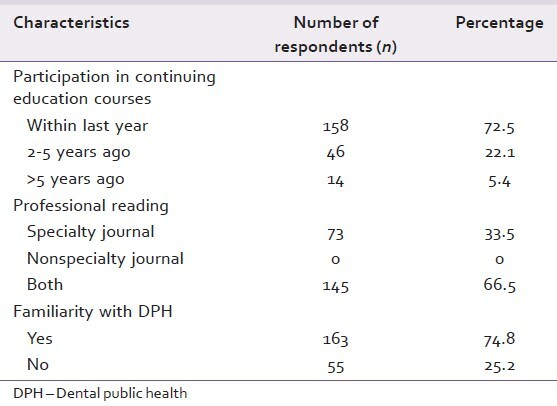 Three-fourth of the respondents was familiar with the field of DPH [Table 2]. Dental faculties knowledge of preventive dental care in relation to caries was the most accurate regarding the role of sugar consumption (mean ± standard deviation: 3.47 ± 0.78) and sealants (3.41 ± 0.64) followed by the role of water fluoridation (2.97 ± 1.00). The least accurate knowledge was seen with respect to the superiority of the use of fluoride toothpaste over brushing technique (1.35 ± 1.25) and use of sharp explorer in damaging enamel rods while examining initial carious lesion (1.96 ± 1.42). The dental faculty exhibited more knowledge about association of periodontal disease with cardiovascular disease, low birth weight, and diabetes (3.11 ± 0.91) whereas it was minimal for the use of fluoride in promoting periodontal health and preventing dental caries (2.50 ± 1.03) [Table 3]. In relation to oral cancer, dental faculties were more aware about the importance of early diagnosis (3.43 ± 0.62), health education (3.31 ± 0.87), screening (3.19 ± 0.91), and risk factors (3.04 ± 0.88) whereas they were unaware about the diagnosis of oral cancer in older age groups (1.77 ± 1.20). Dental faculties were found more knowledgeable about the use of space maintainer (3.67 ± 0.58), care of deciduous dentition (3.45 ± 0.71), etiology (3.56 ± 0.55), and risk factors (3.36 ± 0.62) of malocclusion. Majority of the respondents considered regular dental visits to be important for preventing oral diseases [Table 4]. 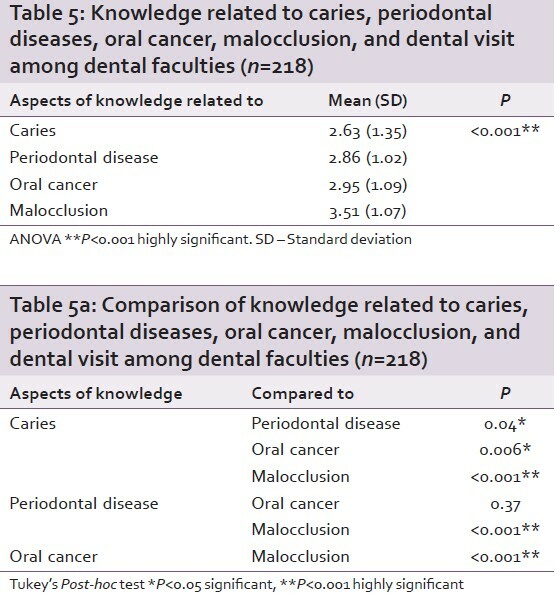 When comparing overall knowledge of preventive dental care, statistically significant differences were found for knowledge related to prevention of caries, periodontal diseases, oral cancer, and malocclusion (P < 0.001). Dental faculties considered prevention of malocclusion to be the most important (3.51 ± 1.07), followed by oral cancer (2.95 ± 1.09) and periodontal diseases (2.86 ± 1.02). The least knowledge was seen for the prevention of dental caries (2.63 ± 1.35) [Table 5]. Statistically significant differences were found between preventive knowledge of all these oral diseases except between periodontal diseases and oral cancer using Tukey's Post-hoc test [Table 5]a]. Most positive attitudes were seen by the respondents who characterized preventive dentistry as essential (6.34 ± 1.05), useful (6.32 ± 1.07), and valuable (6.27 ± 1.00) to the community. The lesser positive attitudes were found for some dental faculty-related aspects, indicating that preventive dentistry was difficult for faculty to practice (5.42 ± 1.66) and less reputable for faculty (5.87 ± 1.28) [Table 6]. As to the categories of dental faculty's level of knowledge of preventive dental care, 81.2% fell into the high category, 18.8% medium, and none in the low category. For further analysis, respondents belonging to high level of knowledge were considered. Statistically significant differences were found for dental faculties' knowledge and participation in continuing education courses (P < 0.001), their professional reading habits (P < 0.001) and familiarity with DPH (P < 0.001). No significant differences were found with respect to gender, Department of Teaching, and years of experience. Of all the respondents, 93.6% belonged to the high level of positive attitudes toward preventive dental care, while 5.5% demonstrated a medium and 0.92% a low level of positive attitudes. For further analysis, participants with a high level of positive attitudes were considered. Statistically significant differences were found when comparing dental faculties attitude in relation to years of experience in teaching (P < 0.05), participation in continuing education courses (P < 0.001), their professional reading habits (P < 0.001) and familiarity with DPH (P < 0.001). No significant differences were found with respect to gender and Department of Teaching [Table 7]. Preventive oral health education is in transition stage in India. Despite the current emphasis on prevention in dental education, and although there have been some studies of the preventive knowledge of dental students, dentists, and dental hygienists, very few studies have focused on the orientation of preventive aspects among dental faculty. To our knowledge, no study exists on the preventive knowledge and attitude of dental faculty in Bangalore city. In the present study, the highest knowledge was seen among dental faculties regarding prevention of malocclusion followed by oral cancer and periodontal diseases. The least knowledge was seen for the prevention of caries. This indicates that despite, dental caries being, one of the most common oral diseases affecting individuals, there is a need for dental institutions to focus more on caries prevention programs in order to increase the knowledge of dental faculty. With respect to dental caries, the present results indicate that the majority of dental faculties have acquired adequate knowledge regarding the influence of sugar, sealants, and water fluoridation on dental caries; this is in accordance with the findings of a similar study by Ghasemi et al. and Khami et al. On the other hand, deficiencies were evident in the knowledge of the role of fluoride in caries prevention in comparison to brushing technique and of some aspects of caries initiation and progression, Similar deficiencies in this respect have recently been reported for Iranian dental students,  dentists,  and dental educators. This is contrary to the opinion of a group of experts that fluoride plays an important role in caries prevention. These may stem from a lack of attention paid to the role of fluoride in caries prevention and cariology in dental education, which calls for putting more emphasis on these subjects in dental curricula and continuing education. In relation to oral cancer, the present results indicate that the dental faculty considered early diagnosis, health education, and screening as an important tool in the prevention of oral cancer. Majority of them were aware of the risk factors for oral cancer while on the other hand, deficiencies were evident in the knowledge regarding the diagnosis of oral cancer in older age groups. These findings are consistent with the similar studies done by Clovis et al.,  Carter and Ogden,  and Pakfetrat et al. Regarding prevention of malocclusion, majority of respondents knew about the adverse effects of oral habits on the future alignment of teeth, importance of space maintainer, deciduous teeth, and timely restoration of carious teeth. Attitudes are influenced by beliefs and values, personal needs, and behavior. Overall, the dental faculty in this study showed positive attitudes toward preventive dentistry, characterized as being essential, useful, and valuable. This is a positive indication that they are willing to become involved in preventive care. On the other hand, they find preventive dentistry difficult to practice and personally disreputable. Similar findings have been reported in a study by Ghasemi et al. and Khami et al. These attitudes among dental faculties may originate from their lack of importance given to prevention during their training and education and perceived barriers in their practice as inadequate reimbursement, time limitation because of high demand for curative care, and unwillingness of patients to pay for prevention. According to the results of the present study, no gender differences were seen among dental faculties for prevention-oriented knowledge and attitudes, whereas a study conducted by Ghasemi et al. and Khami et al. reported more positive attitudes among female dental faculties as compared with their male counterpart. A study was done by Khami et al.,  where the faculties working in the Department of Pedodontics, Conservative Dentistry and Endodontics, and Periodontics had more extensive knowledge of prevention, while in our study no significant differences were seen in relation to Department of Teaching for prevention-oriented knowledge and attitudes. Thus, from our study, it can be expected that dental faculty, regardless of their discipline, possesses basic knowledge of prevention and positive attitudes toward preventive dentistry. In relation to years of experience in teaching, no significant differences were found among dental faculties for preventive knowledge and positive attitudes were seen toward preventive dentistry which was statistically significant. The significant results in our study may be due to more number of respondents with 4-8 years of experience in teaching. Dental faculty who were familiar with the field of DPH reported high level of knowledge and positive attitudes toward preventive dentistry. 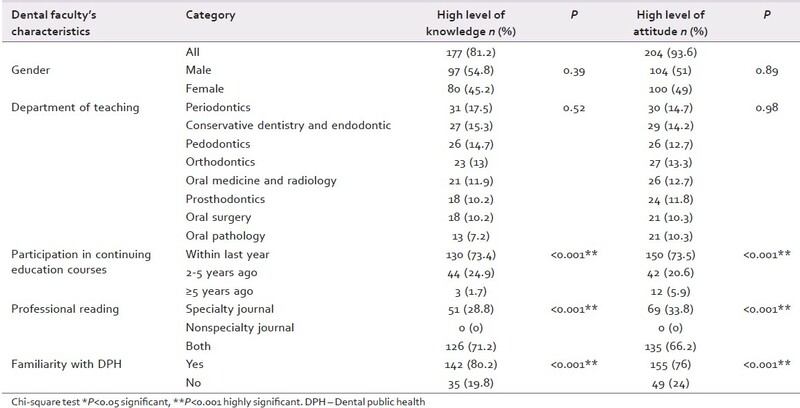 These findings together with results from a study by Khami et al.,  show that familiarity with DPH can be considered an indicator of dental faculty's knowledge and attitudes toward prevention, and it emphasizes the importance of assessing knowledge and attitudes in dental education. As nonresponses, misconceptions, and errors are common with surveys using a self-administered questionnaire; these should be minimum in our survey, since the respondents were highly educated health professionals. Faculty of public health dentistry department was also excluded from our study, as this might influence our results indicating high level of knowledge, since it mainly deals with prevention-related research. In interpreting the findings of the present study, it is important to acknowledge possible limitations. The cross-sectional design allows investigation of potential links between the level of knowledge and attitude; causality clearance, however, requires longitudinal studies. There is a possibility of social desirability bias wherein the respondents over or under report the knowledge and attitudes because dental faculty tend to be more interested in the topics of the questionnaire related to their specialty. Furthermore, some of the faculties gave back the filled questionnaire after 1-week; this may lead to the possibility of reporting bias. As practice was not included in the study, prevention-oriented knowledge and attitudes found may not, however, relate to dental faculty's everyday professional activity. Our study concluded that the dental faculty in Bangalore had good knowledge of preventive dental care which was significantly different with respect to oral diseases and had positive attitudes toward preventive dentistry. Reduction in oral diseases and increasing the availability and adoption of appropriate preventive procedures will not occur without the adequate knowledge of dental faculty as they are involved in training the future dental professionals. This can only be achieved if dental faculties are involved in continuing education activities and placing emphasis and support on prevention-related research. Institutional changes to assure adequate reimbursement for age-appropriate oral disease prevention strategies should also be considered. The following measures may be taken to improve the dental faculty's knowledge about preventive dental care and to expand their role in the same. Making policy, regulatory, or institutional changes to assure adequate reimbursement for age-appropriate oral disease prevention strategies. 1. Gift HC, Corbin SB, Nowjack-Raymer RE. Public knowledge of prevention of dental disease. Public Health Rep 1994;109:397-404. 2. Raj SM, Prasad KVV, Javali SB. Factors affecting the knowledge on prevention of oral diseases among school teachers of Dharwad City, a survey from India. Webmedcentral Dent 2011;2:1-14. 3. Hamissi J. The Principles of Prevention in Dentistry. Oral Health Care-Pediatric, Research, Epidemiology and Clinical Practices. InTech: Europe; 2012. 4. Ghasemi H, Murtomaa H, Torabzadeh H, Vehkalahti MM. Knowledge of and Attitudes towards Preventive Dental Care among Iranian Dentists. Eur J Dent 2007;1:222-9. 5. Khami MR, Virtanen JI, Jafarian M, Murtomaa H. Oral health behaviour and its determinants amongst Iranian dental students. Eur J Dent Educ 2007;11:42-7. 6. Khami MR, Murtomaa H, Jafarian M, Virtanen JI. Knowledge and attitude of Iranian dental school educators towards prevention. 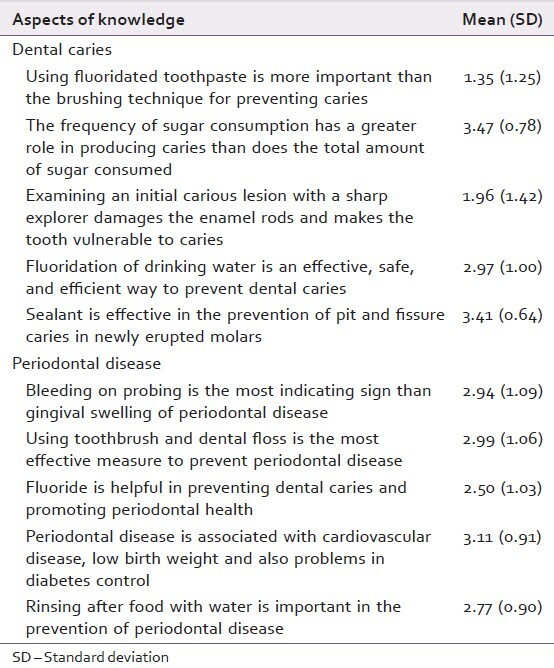 Oral Health Prev Dent 2007;5:181-6. 7. Rabiei S, Mohebbi SZ, Patja K, Virtanen JI. Physicians' knowledge of and adherence to improving oral health. BMC Public Health 2012;12:855. 8. Clovis JB, Horowitz AM, Poel DH. Oral and pharyngeal cancer: Knowledge and opinions of dentists in British Columbia and Nova Scotia. J Can Dent Assoc 2002;68:415-20. 9. Khami MR, Virtanen JI, Jafarian M, Murtomaa H. Prevention-oriented practice of Iranian senior dental students. Eur J Dent Educ 2007;11:48-53. 10. Bozorgmehr E, Mohammadi TM, Hajizamani A, Vahidi A, Khajoee F, Knowledge, attitude, and practices of pediatricians about children's oral health. 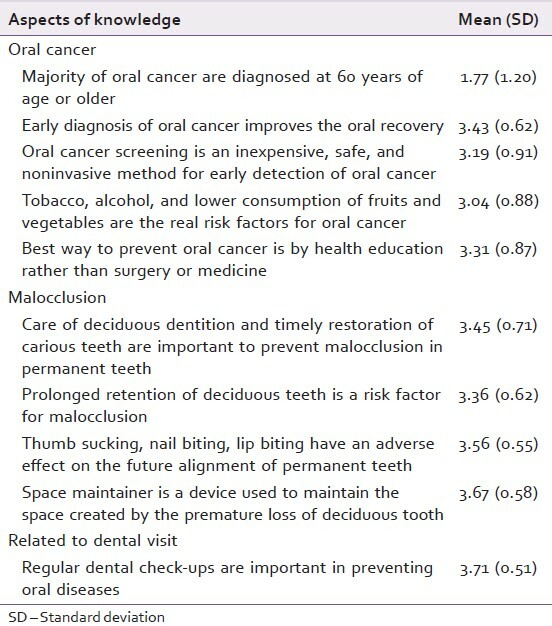 J Oral Health Oral Epidemiol 2012;1:93-8. 11. Farsi JM, Farghaly MM, Farsi N. Oral health knowledge, attitude and behaviour among Saudi school students in Jeddah city. J Dent 2004;32:47-53. 12. Bader KA. Oral health knowledge of periodontal disease among university students. Int J Dent 2013;1:1-7. 13. Padma K, Kumar A, Aruna CN. Preventive oral health knowledge, practice and behavior of patients attending dental institution in Bangalore, India. J Int Oral Health 2010;2:17-26. 14. Carter LM, Ogden GR. Oral cancer awareness of general medical and general dental practitioners. Br Dent J 2007;203:E10. 15. Pakfetrat A, Falaki F, Esmaily HO, Shabestari S. Oral cancer knowledge among patients referred to Mashhad Dental School, Iran. Arch Iran Med 2010;13:543-8. 16. Autio-Gold JT, Tomar SL. Dental students' opinions and knowledge about caries management and prevention. J Dent Educ 2008;72:26-32.